Antonio Masiello is an award-winning Italian photojournalist who photographed the hero image for 6 Degrees Citizen Space 2017. 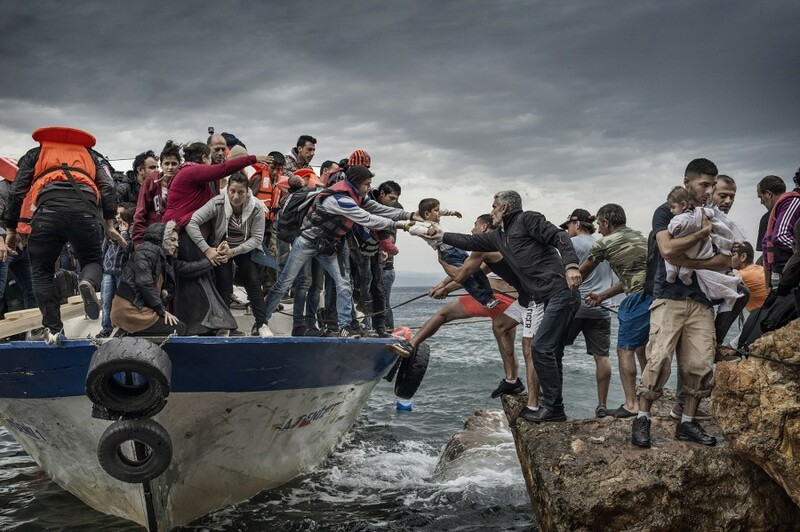 He shared with us some context about this photograph that was hurriedly caught before lending a helping hand to refugees disembarking along a treacherous seawall. 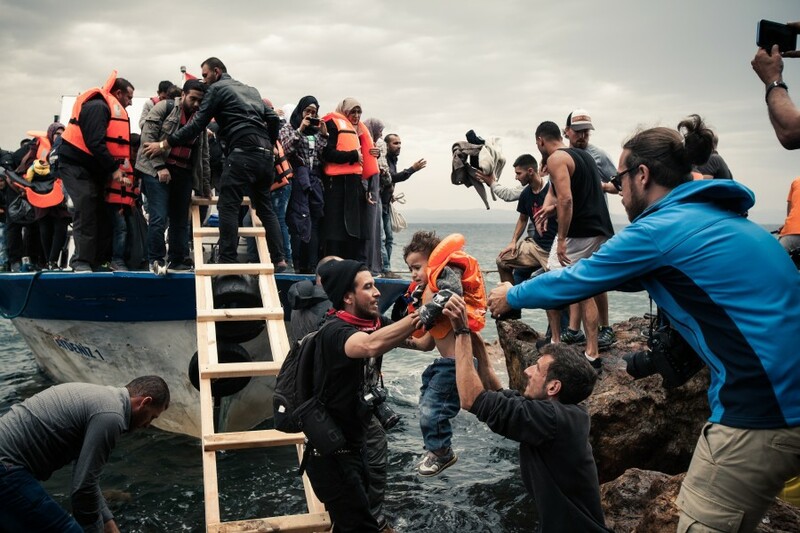 I was documenting the European migrant crisis in Lesbos, Greece, where an alarming number of Syrians, Afghans and Iraqis were paying thousands of dollars to reach the island, the first step of their journey to find asylum and dignity. Unfortunately not all of them were able to continue their journey and thousands have died in the Aegean Sea. Driven by curiosity and a desire to understand why the European Union was still trying to handle this emergency with no success, I left for Greece. It was October 11, lunch time, and landings continued uninterrupted along Lesbos’s coast. I was with a group of colleagues when we saw and heard from a distance a boat that was coming into a particularly difficult coastline. We had been on the island for four days and in that moment, we knew that something was going to happen. We all ran into the water following the boat’s steerer. I found myself facing a Dantesque scene: screams, cries, women, children and men shouted for help. The smuggler who illegally drove the fishing boat full of families tried deliberately to disembark over the most difficult point of the coast to not attract much attention. Disembarking them more like goods than people, he then left heading to Turkey, probably just for another roundtrip. Immediately, some volunteers helped the children and then with the help of a ladder, helped the rest of the refugees get off the boat. I took this photo from a small rock perfectly perpendicular to the boat. I can’t say I chose this cliff, but now I can say it was a perfect spot. I did not have much time to take the picture because helping those people get off the vessel was the priority for everyone. I put my camera down after a few shots, and I started to help people. I did not immediately realize that they were good pictures. The impact of this sort of situation is not something you realize immediately. Immediately you are too busy to think about it. I realized at the end of the day when I saw the photo. It was probably the first time I felt so involved and I was full of sadness, and felt powerless. I am very attached to this photo, not only for personal reasons but also because it gives to history such a powerful image, which I think is fundamental for everyone to understand what is going on. Antonio Masiello was born in Rome on 1987. After studying photography at Cine-Tv R. Rossellini school in Rome, in 2013 he became a journalist and began to work as a freelance photojournalist. He has traveled to Kosovo, Lebanon and Iraq to document the foreign missions of the Italian Army. His work covering refugees won the award of excellence at Picture of the Year International and other international awards. Currently Masiello is independent and photographs national and international general, spot and breaking news.